For the past 8 months, I've found myself in the kitchen for most of my days. Of course this is by choice, as my life is devoted to food and if I'm not tinkering around in my kitchen trying to come up with awesome stuff to eat, I sometimes feel like I've wasted an entire day. You see, I've never been the type to sit around and watch TV all day. In fact, that's probably my least favorite thing to do in the world. Well, if you count math as an activity, I'll probably choose an hour or two of TV over that, however for the most part, I like being productive. I love learning new things ( trying out a new recipe for instance ) and if it's a beautiful day outside, I love exploring the world around me. For me, there's never enough time to see and do everything I want. As many people know, I've been extremely overweight for a significant part of my life and although I try to stay as active as possible, I do end up eating a lot of what I make in the kitchen, which means lots of pancakes for breakfast, salads for lunch ( mostly healthy ) and numerous cookies, cupcakes and sweet treats. Oh, I even learned how to make no-churn ice cream over the summer and boy did I make ( and consume ) a lot of that! As a result, I've gained more than a few pounds and although 2-3 pounds is OK, more than 5 pounds is just unacceptable. So as soon as I made the last batch of Halloween cupcakes last week, I decided that it might be best to get back to my healthy weight. I simply need to lose 6-8 pounds and I'd be happy once again. So because of this, I'm back to avoiding things like bread, rice and noodles for the most part and I already feel better about myself. To help me with my cravings for rice, I substitute cauliflower. I eat spaghetti squash in place of noodles. And when I crave bread and I need it fast, I turn to this recipe. This is my go-to recipe for low-carb bread and it's ready in mere minutes. Of course it doesn't compare to the real deal and no low-carb bread will ever compare to a crusty loaf of freshly baked baguette. Nothing! However for the sake of losing weight and improving health, this quick bread will do. It's really good for breads made without flour and the sunflower seeds add nuttiness as well as crunch to the bread. The method is simple. You basically mix everything up, pour it into a mug and zap in the microwave for 90 seconds. That's it! It's so ridiculously easy to make, even a 5-year old could probably whip this one up. 1.Grease one mug with some oil. 2. Put all the ingredients in a small bowl and mix well with a fork. 3. Pour the mixture into the mug. Microwave on high for 90 seconds. You might need to cook it a few seconds longer depending on your microwave oven. 4. Let it cool in the mug for 3 minutes. 5. Gently pop the bread out of the mug and slice. You may want to pop the bread slices in the toaster for a few minutes. This will give it a bit more structure and make it easier to smear butter or jam on them. Feel free to add your favorite add-ins such as raisins, walnuts and even blueberries. If you enjoyed this recipe, or would like me to keep experimenting, please let me know in the comments below. If you have a recipe suggestion or have something you'd like to see me make, you can leave me a comment as well. I also want to let you know that I recently launched a YouTube channel for TabiEats. Currently there are only a handful of videos and they are mostly of travel. However I have plans to start releasing videos at least twice a week very soon so stay tuned. As always thanks so much for reading and bon appetit! 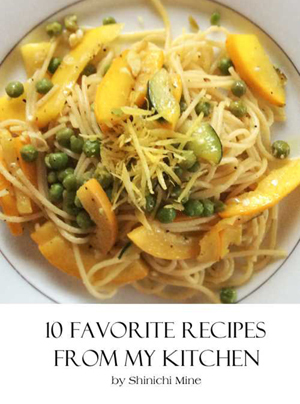 Subscribe to this blog and get a FREE copy of my 10 favorite recipes. It's in PDF format and you'll be able to download the file immediately after confirming your subscription. I know it's only 10 recipes but I think you'll find something you like in there. Also you'll be getting regular updates ( once a week at most ) from me and I never share your information with anyone else but my dog Justin. That's my promise to you. So what are you waiting for? Subscribe to TabiEats today! There are many brands out there selling almond flour and after testing a few of them out, I prefer this brand to others. Not only does it have a great flavor, my baked goods never come out gritty and always moist. If you've never tried cooking with almond flour before, you'll be surprised at how easy it is to use it in place of white flour. It works especially well for baking and is perfect for those trying to cut carbs or gluten out of their diet. Almond flour adds a hearty flavor without empty calories. Full or protein and dietary fiber, almond flour adds richness and flavor to your recipes. Shinichi, those look really good. I don't have a microwave. I wonder if I could bake this in a small loaf pan in the toaster oven. Hi Grace. Nice to see you here! I've never really tried it that way, but I don't see why it wouldn't work. Could you let me know if it works out? Thanks and good luck! Making a Salad with Makomotake?